For two weeks I cared for my sister who is recovering from Leukemia. We had quality time to do anything or nothing. I wrote, she crocheted, we colored, and I put together a thousand piece jigsaw puzzle. Besides a stiff neck, the puzzle assembly gave me thinking time. The process from start to finish, of connecting small pieces to form a recognizable object, reminded me of writing. Choose a puzzle with a picture you like. The same goes for writing topics. Before your start, organize the pieces by straight edge, color, and design. Before writing, organize your thoughts by characters, plot, concept, location, etc. Build straight edge borders first. Books, features, and poems need boundaries too. Work on one area until you’re stumped, leave it for awhile and come back to it later. Approach writers block the same way. The beginning and end are often more exciting than the middle. Rely on detail in each piece. Descriptions guide placement of what we write. Continually check the picture on the box. Reference your favorite author’s style and technique. Don’t force a piece to fit. If an idea is good, it belongs in something you write. Don’t get discouraged. Every project has ups and downs. Take breaks. Pressure and stress will not create a masterful paragraph, chapter, feature, or document. Celebrate when you complete a section of the puzzle. Celebrate completed chapters, articles, deadlines, etc. Don’t give-up. All puzzle pieces will fit somewhere. Ask for help. Another set of eyes can spot a missing piece. Have someone else read and edit your writing. When finished, you know it, so stop. Everything we write also has an end and an ending. Enjoy and admire the finished product. Remember, not everyone will like it. Expect some people to criticize your efforts. Some will admire your skill and tenacity. Like a puzzle, writing is a process, and it has a beginning, a middle, and an end. Every stage can be fun as well as frustrating. Both require a never give up attitude. Writing, unlike a puzzle, takes creativity, and when you gift it to the world, you share part of your soul. What activity resembles YOUR writing process? 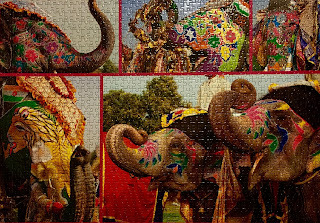 Jigsaw puzzles are addicting. I can be up until 3 o'clock in the morning without realizing it just finding one more piece. Writing till 3 in the morning? Nope. Maybe until 1am if I'm inspired. My mom and grandmother crocheted and I tried to learn several times. It's not my thing, I've finally decided. I treasure the afghans my mom made for me. Hope your sister is on the mend. This is a great comparison and is especially applicable to mystery writers. The classic mystery is a puzzle, and the writing of a mystery involves putting all the pieces together in a way that feels logical but makes the reader work hard to solve.